Actor Nakamura Shunta (31) has been released with a suspended indictment following his recent drug arrest. The son of actor Nakamura Masatoshi (58) and actress Igarashi Junko (56) was nabbed by police in Tokyo on April 4 for possession of marijuana. But the Tokyo District Court decided that as it was a first offense, the amount of the drug was small, and perhaps most importantly he showed the required remorse, he would not be prosecuted. On his release yesterday afternoon, he bowed deeply to reporters outside the Takaido police station and muttered a one-word apology, “Sumimasen” (sorry). He was then bundled into a waiting car by his managers and lawyer, who said he plans to formally apologize at a press conference in the next few days. His parents did not visit him during his 10-day detention, but they issued a statement yesterday. “We heard that he received leniency and was released. His lawyers tell us that he is both physically and mentally drained by the incident. We will give him some time and then talk with him about he should repent, apologize and get on with his life.” Masatoshi, who is also president of the management agency that handles him, originally said he would see that his son gave up show business. His name has been taped over on posters promoting the movie “Kondo no Nichiyobini,” which opened last Saturday, though his scenes have not been cut. • Details still haven’t emerged as to what exactly talento Kitano Makoto (50) said on air to get himself into so much trouble. But his Shochiku Geino management agency and the Asahi Housou network have resigned from the Japan Association of Music Enterprises as a result. Shochiku has also taken internal disciplinary measures against several employees. JAME has said that the problem is not just Kitano’s remarks about a particular individual. They said that, during the more than 20 years that his “Makoto no Seinendan” show has been on ABC radio, he has a history of inappropriate and slanderous remarks. They filed a formal complaint with the two companies in March. JAME has about 100 talent agencies and 40 broadcast networks among its membership. A popular and well-known celebrity, Kitano has been dropped from all of his regular TV and radio shows and his show business future is in doubt. • Meanwhile, more trouble over at TBS. The network was ordered to compensate a man identified without permission during a live morning show in January 2007. The Mino Monta-hosted “Asa Zuba!” show included a live segment on a murder scene where a Tokyo woman had killed her husband and dismembered his body. The face of the man who sued the network was clearly visible during the broadcast and he was identified as a garbage truck driver. 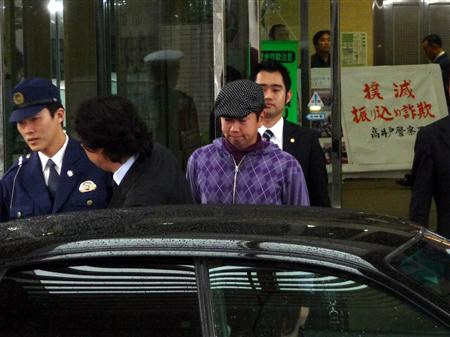 At the Tokyo District Court, he sought ¥11 million in damages from TBS and Mino, claiming that the unwanted exposure had led to his son being bullied and forced to change elementary schools. The court ordered TBS to pay ¥1.2 million but said that Mino bore no responsibility.